As Tom Sellek says “I know what you’re thinking”. Why is there a story in Nostalgia Drag World about a car show? Not just any car show but a Concours d’Elegance! Aren’t they for the crème de la crème of antique and classic cars like Bugattis, De La Hays, and Rolls Royces to name a few ? Yes they are! 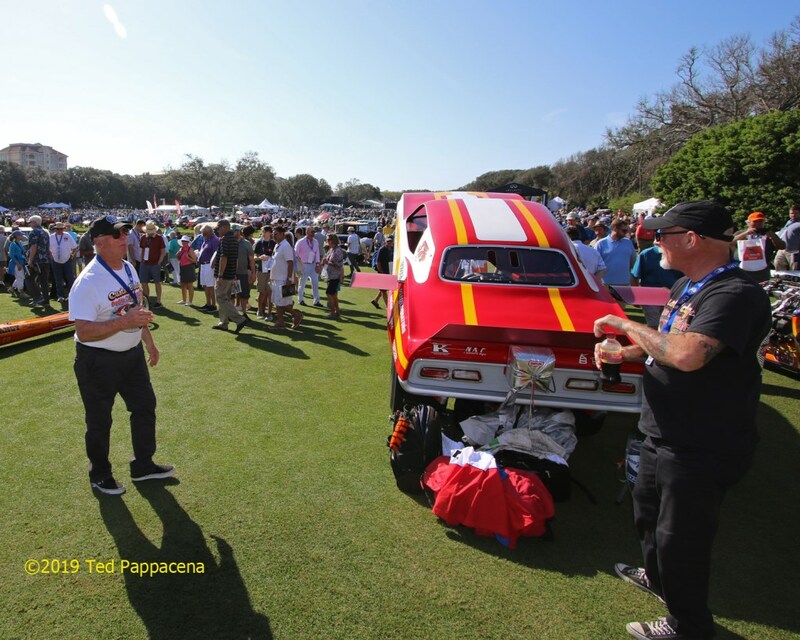 However this years’ edition of the show besides honoring legendary F-1, Le Mans, and Can Am driver Jackie Ickx and a gaggle of legendary Porsche racers, had a display in conjunction with the 50th anniversary of the NHRA Gatornationals. It was a display of legendary cars from the golden years of our beloved sport. I found out about this during a conversation I had with my friend Ross Howard (owner of one of the cars in the show, the 1973 Custom Body Challenger AA/FC). 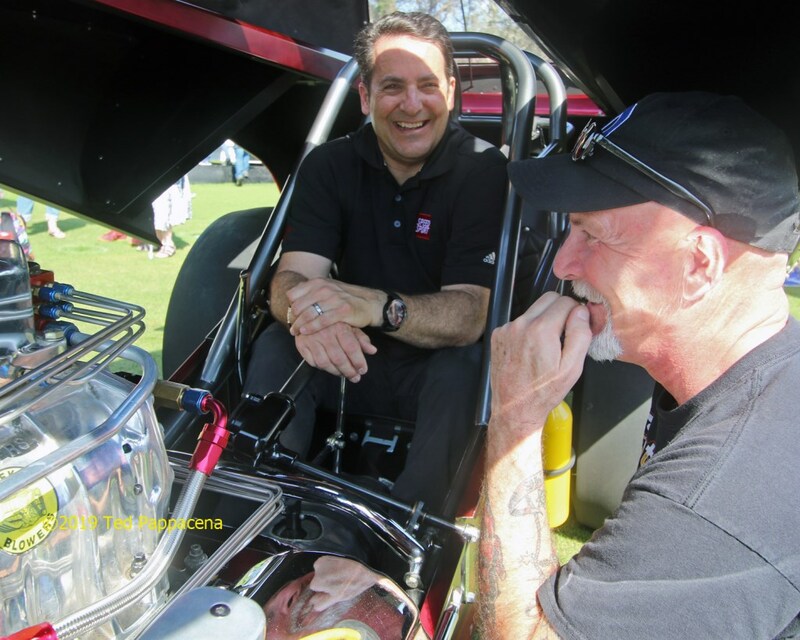 He mentioned that he had been invited by NHRA Museum director Larry Fisher to be one of the exhibitors. I in turn mentioned it to my wife and since we were planning a trip to South Carolina and Florida she suggested we hit the show on the way. Knowing this, I called Rob Huckstadt of NDW to see if he’d be interested in a story. He enthusiastically said “Yes” and here it is. Ross Howard brought the 1973 Custom Body Challenger to the invite only display. Initially Ross told me there would be a “significant” display of 8 cars. It turned out to be 7 but who’s counting? And what a group it was. Ross’ Challenger, the 1967 Buick Wildcat funny car called “Ingénue” originally from Brooklyn, New York, Randy Bradford’s Fiat AA/FA, and Ron Hope’s Rat Trap AA/FA, John Neas’ Tony Nancy “Sizzler” fueler and the Dunn & Reath rainbow fueler, and rounding out the field, Don Garlits’ Swamp Rat 13. Interestingly, the two John Neas cars originated in California but now reside in Oklahoma, the two fuel altereds originated in California but now reside in Seattle Washington (Bradford’s) and Tennessee (Rat Trap), the two funny cars originated in New York but now reside in California (Ingénue) and Oklahoma (Custom Body). The only car that stayed where it came from is Garlits’ Swamp Rat 13. Got that? 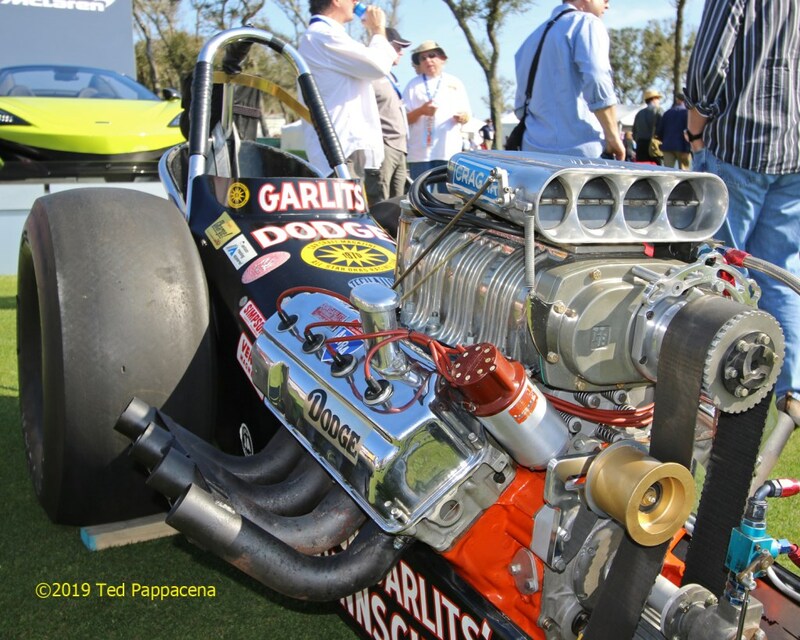 Don Garlits had Swamp Rat XIII on display. The Old Man wasn’t in attendance nor was the car cackled. Too bad. 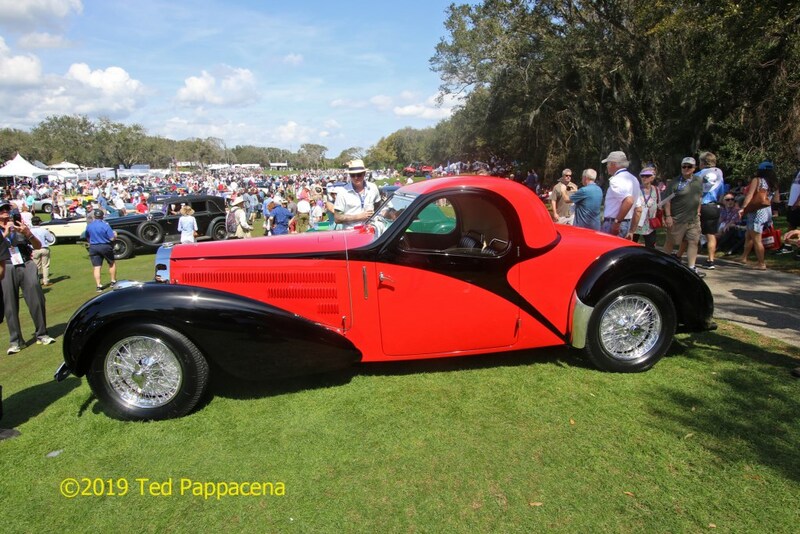 This is an example of the type of car that is commonly at a Concours d’ Elegance, a Bugatti Type 57 Atlantic Coupe. The event itself runs for 4 days; Thursday through Sunday with Sunday being the actual day of the Concours. Cars were set up on the golf course next to the Ritz Carlton hotel at 3 P M Saturday afternoon and covered up until Sunday morning. The show opens at 9:30 and goes till 4 PM. There are many judges dispersed throughout the show and winners in the various classes are awarded ribbons. However to my knowledge none of the NHRA cars were judged. Pity. 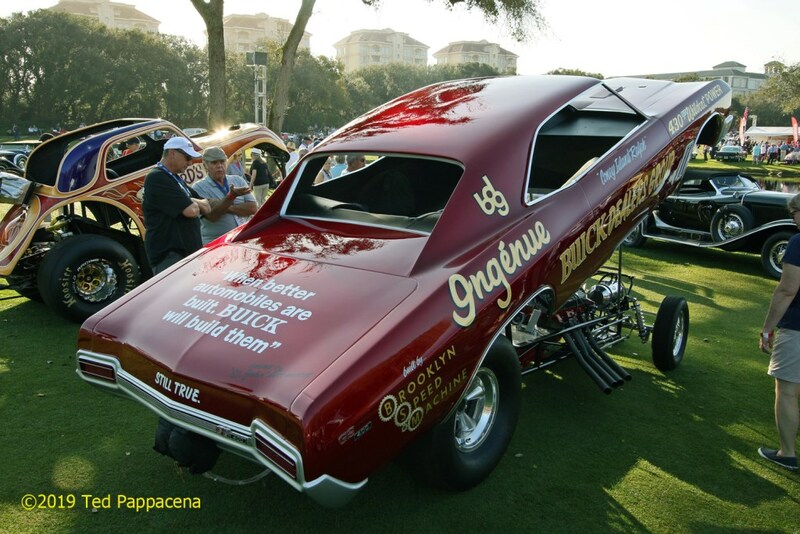 John Lipori brought the 1967 Buick Wildcat “Ingénue” all the way from San Jose. Another stunning restoration. 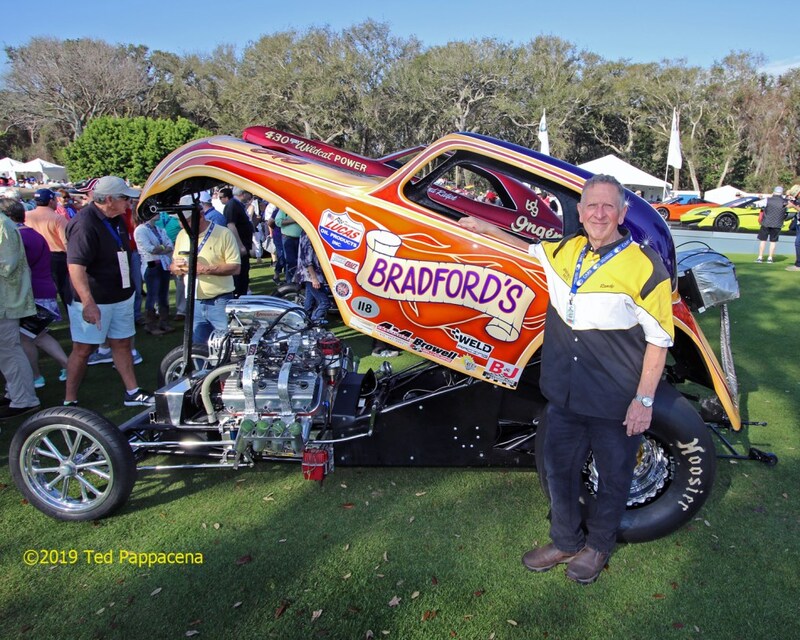 Randy Bradford brought the Bradford’s Fiat AA/FA all the way from Seattle Washington. If only there was a “Long Distance Award”. I got there with time to spare and found myself in an “early entry” line so I got in at 9:15 and proceeded straight to the drag cars. I have to say that if I didn’t know beforehand about this display I would have been beside myself seeing the cars. Besides Ross, I knew John Lipori and Randy Bradford (through social media) but I finally got to meet them in person. I made new friends with the rest. 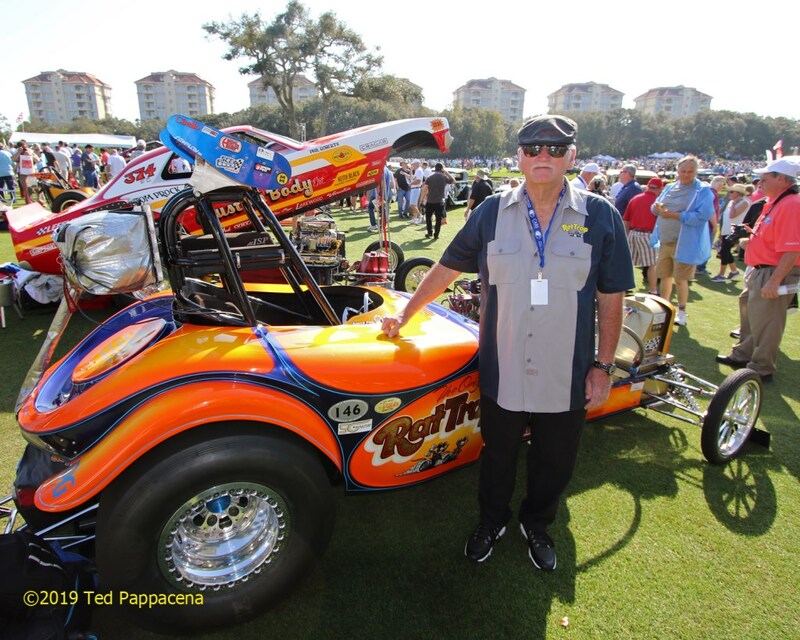 As I mentioned before Garlits was not there but I’ve met him many times through the years. Besides seeing this great gathering, the extra bonus was a cacklefest at 12:10 PM. Ross and I became faster friends when we finally met (in person) and his spot became my home base and I became the “official photographer”. That came in mighty handy when officials set up a perimeter prior to the cacklefest. “You’re with the car, right?” the official said to me. “Sure am”! Says I.
Ralph Sheheen cackles the Custom Body Challenger. I can guarantee there was an ear to ear grin beneath that mask! Ross and Utica, N Y native Ralph Sheheen laugh it up during the finer points of cackling. The Custom Body spot was my home base for the show. Ross took good care of me with chocolate chip cookies throughout the day. To the left is the “Okie Smoker” Larry Brown hisself, a walking drag racing driver extraordinaire! A special guest was on hand to cackle the Custom Body Challenger; Utica native and Speed Sport reporter and T V host Ralph Sheheen. Not knowing the car was to be there he freaked when he saw it. 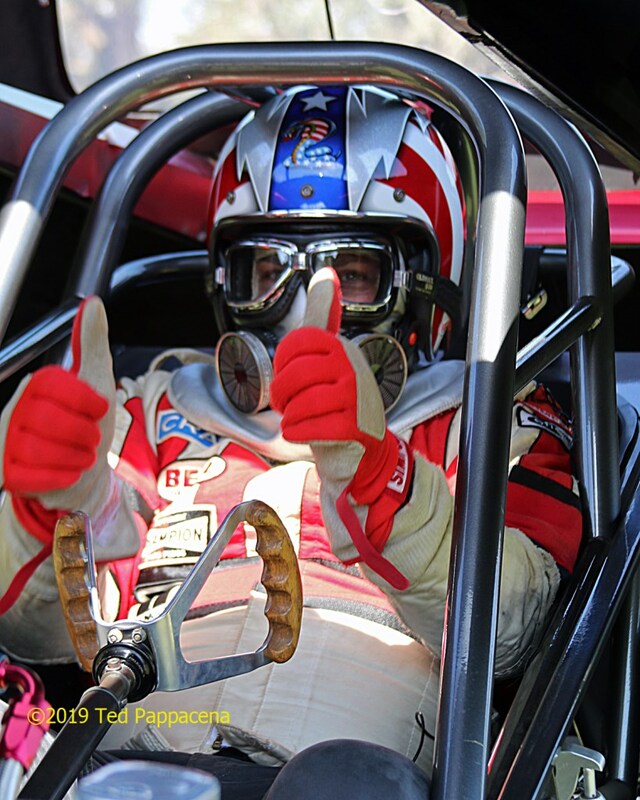 After all, it was his favorite funny car when he first saw it growing up in Utica, N Y. Naturally when Ross found this out he was tapped to cackle the car. I’d like to point out that Ross’ traveling partner and helper is none other than Larry Brown the “Okie Smoker”. 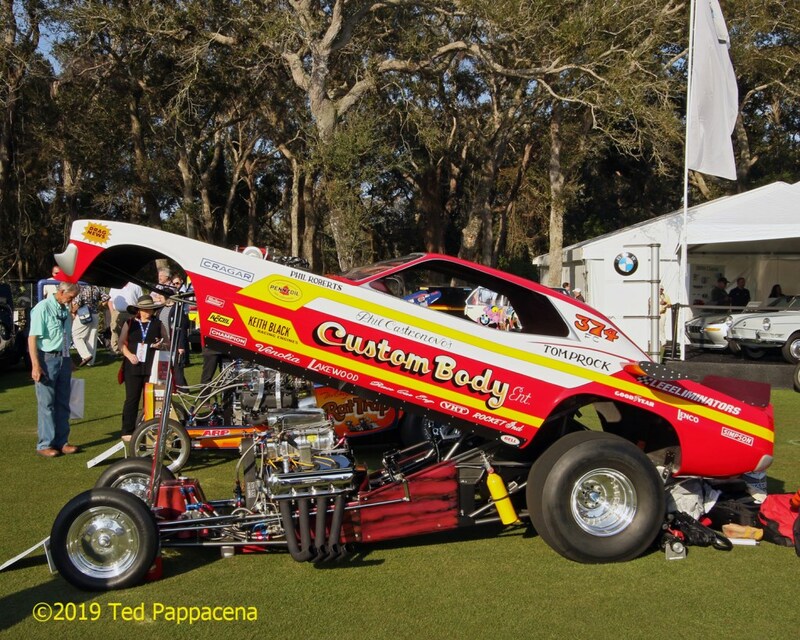 Larry has driven everything from altered wheelbase A/FX cars to top fuel and funny cars. 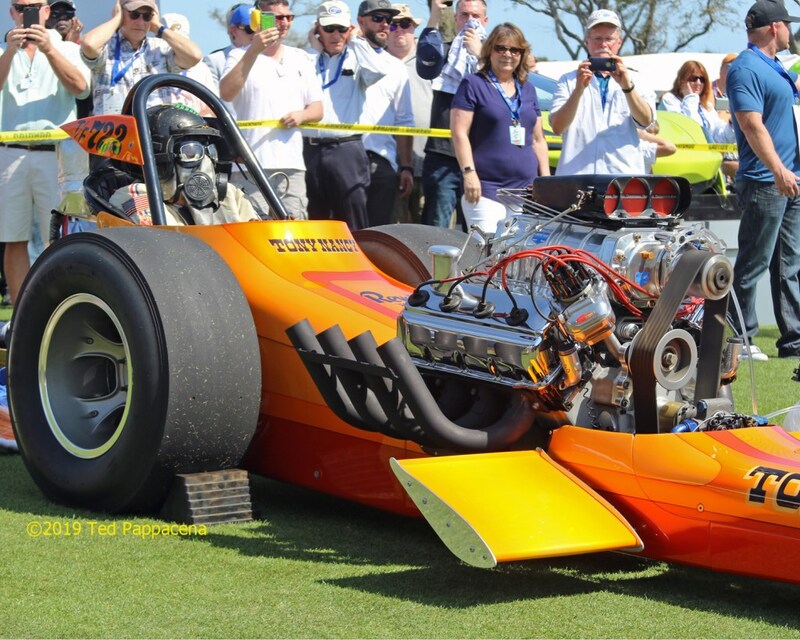 Those of us who know the history of the sport know that Larry’s rear engine dragster puked the engine right out of the car at the 72 National Challenge in Tulsa in as seen in the iconic Steve Reyes photo. It sure was fun recording the proceedings situated in front of the car with the Rat Trap to my left and the Tony Nancy “Sizzler” to my right. By the way, “Hand Grenade” Harry Hibler cackled the “Sizzler”, Randy the Fiat, John did Ingénue, and Ron Hope was at the wheel of the Rat Trap. 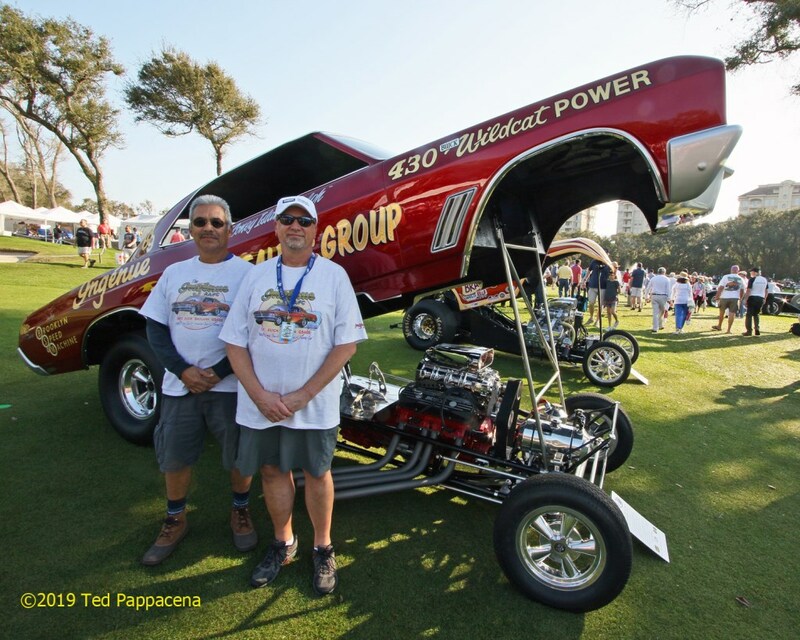 John Neas of Oklahoma brought 2 classic west coast fuelers. The Tony Nancy “Sizzler” is simply gorgeous. Thank God it was a sunny day! 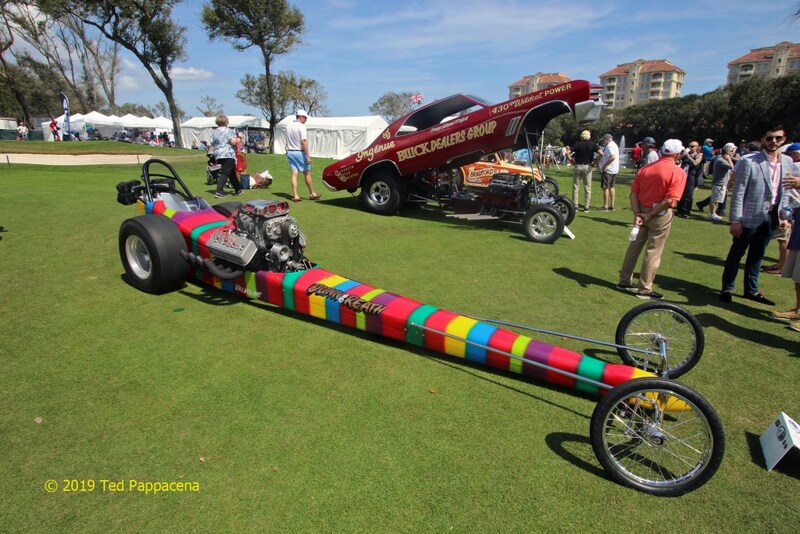 The second car that John Neas brought was the west coast fueler of Dunn & Reath, the famous “Rainbow” car. 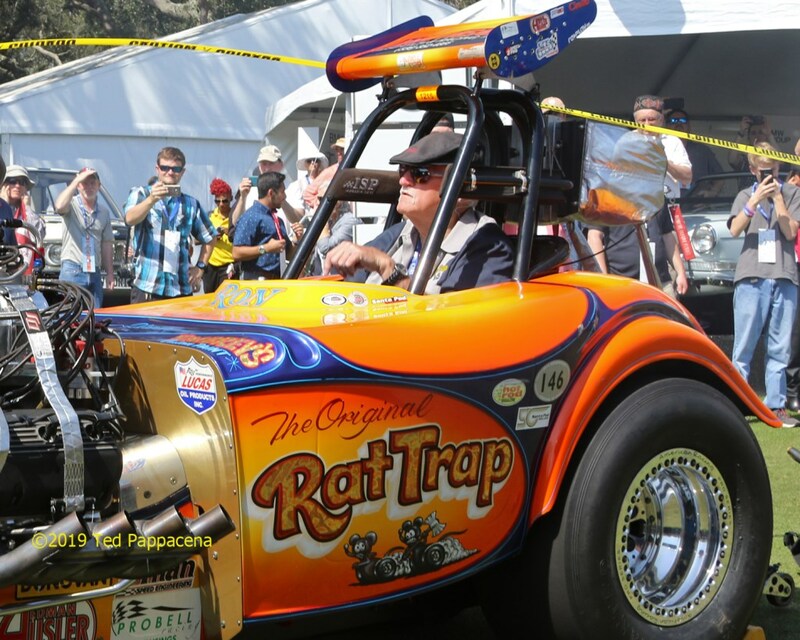 Ron Hope stands next to his Rat Trap AA/FA Bantam. Originally from California, the car is now stationed in Tennessee. Goggles, mask, suit, helmet? We don’t need no stinkin goggles, masks, suits, or helmets! Ron Hope brings cackling to a whole new level! “Hand Grenade” Harry Hibler cackled the Tony Nancy Sizzler. John Lipori (r) brought along Jesse Siordia (l) to help cackle the potent Buick. So after spending the first 3 hours of the event in drag racing nirvana, it was time for me to try and see what else was out there. So much to see and so little time. I know I missed a whole field of cars but I did see many rare classics that I’ve only read about. A group of Jackie Ickx’s cars were in one area as were a group of significant Indy 500 cars and many Porsche 956 racers. There was also a display of rock stars’ cars including Janis Joplin’s Porsche, the Corvette roadster that Elvis drove in the forgettable movie” Clambake” and two Porsches that belonged to John Oates (Hall & Oates), not forgetting the Bugatti’s, De La Hays, Rolls Royse’s and so many other great cars. But soon my feet started to complain and it was time to say goodbye to my friends and head back to the hotel. Among the many awards given out at the event, one is called “Best Sound on the Field”. I can tell you what cars didn’t get it. 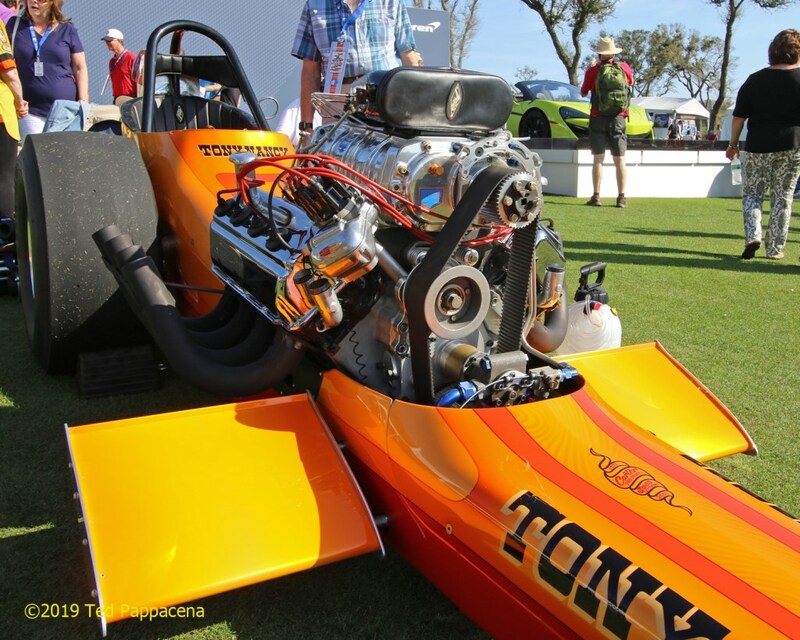 As sweet as a 12 cylinder racing Ferrari sounds nothing and I mean nothing assaults the senses like a nitro guzzling, blown and injected hemi at full song. Especially when the throttle is whacked a few times! The large crowd that gathered to see and hear the cacklefest got it. The judges didn’t. Regardless, there’s a good chance I’ll get to see more next year NHRA exhibit or not.